I posted variations with and without sugar to accommodate both low carbohydrate and paleo/primal eaters. If you make these cookies sugar-free using erythritol, xylitol, and stevia, they will always be soft at room temperature. Cakes and pies are so much easier to de-carb than cookies because they don’t rely on sugar for their structure or texture as much. There is, however, a solution to this textural issue. To achieve that delightfully crispy sugar cookie texture, store your sugar-free “sugar” cookies in the freezer. Seriously! Straight from the freezer, the texture of these cookies is perfect. They’re not icy – just delectably crispy. In the sugar-free recipe, I used a blend of xylitol and erythritol, since the texture of cookies is much better with a mixture of the two sweeteners than with erythritol alone. To make these cookies paleo, use honey and palm sugar as the sweeteners, and arrowroot or tapioca starch in place of the grain flour called for in the recipe. Made with honey or palm sugar, the cookies will be crispy initially, and soften over time, at room temperature. They, too, will taste crispy straight from the freezer. PSA: Be sure to keep these treats away from your pets! Google xylitol and dogs for more information. *You can substitute quinoa flour, rice flour, or sorghum flour for millet flour. Whisk together dry ingredients excluding the erythritol and xylitol. Cream xylitol, erythritol, and butter together until fluffy and smooth. Beat in egg yolk and vanilla. Beat in dry ingredients until dough comes together, then shape the dough into two balls. Wrap dough balls in plastic wrap and chill for at least 1 hour. The dough won’t hold together as well if it isn’t chilled long enough. Roll out dough between two sheets of wax paper or parchment paper, peeling off the top sheet and flipping the dough over on to the other sheet as you roll it out. Flipping the dough and peeling off the top sheet every time you roll the dough with your rolling pin a few strokes ensures that the sheet of dough won’t stick to the paper. Once dough it rolled to 1/8“ thickness, cut it into shapes with cookie cutters and bake them on an insulted cookie sheet lined with parchment paper or a silicone baking mat. Bake cookies at 325 degrees for 13-15 minutes, or until the edges barely brown. Let cookies cook on sheet one minute, then transfer them to a wire rack to cool down completely. To ensure that moisture doesn’t form underneath the rack, prop it up on top of a couple of drinking glasses! I read about this trick and have used it ever since to avoid soggy cookie bottoms. Store cookies in the freezer between sheets of wax paper. Keep cookies frozen and eat straight from the freezer for the best taste and texture. In the spirit of the season, I’m bringing you another GIVEAWAY, sponsored by Iherb.com. Iherb.com is my source for 5 lb bags of erythritol, xylitol, coconut flour, coconut oil, cocoa powder, and NuNaturals pure stevia extract powder. I order from them every couple of months, and my shipment of baking supplies always arrives in great condition within a couple of days of placing the order. They usually slip a few free samples in their packages, too. 🙂 I’m so glad to have found out about them back in 2008 when I started the blog and all of this experimentation with funky ingredients! In the interest of full disclosure, I do acquire rewards dollars when anyone uses the iherb.com coupon code posted in the banner at the left sidebar. This revenue really helps offset ingredient costs for me, along with your donations, so thanks to everyone who has used the code! The winner of this giveaway will win a $50 shopping spree at iherb.com, shipping and handling included! This contest is open to U.S. and international residents. A winner will be picked on December 31st. If the winner lives outside the U.S. (includes Canada), he or she would be responsible for any customs fees, duties, and taxes. Leave a comment with your email address for a chance to enter. If you create a Facebook post or Tweet about the giveaway with a link to this blog post, you’ll receive an extra entry in the contest. « Healthy Chocolate Whoopie Pies are here! Sugar-free, gluten-free, and finger-lickin’ good. Wow these cookies look delicious! Sugar cookies are my favorite holiday cookie. Thanks for the recipe and the giveaway. Happy Holidays! Wow! Just in time- tomorrow I need to make cookies – these would be perfect! Mmmmmmm a sugar free cookie recipe. I will stick with room temperature since I like my cookies soft! Ah, coconut oil! That stuff is so expensive, I will surely check iHerb out! Thank you again for helping me to get healthy while NOT being deprived! These look great! Your cookie cutters are just like my mom's set. 🙂 Thanks for posting all these great recipes! Wow! These look and sound great! I would love to try these and win the giveaway too! Those look great! I'm mad impressed by anyone that can create gluten (and grain!) free roll-out anything. Must try. 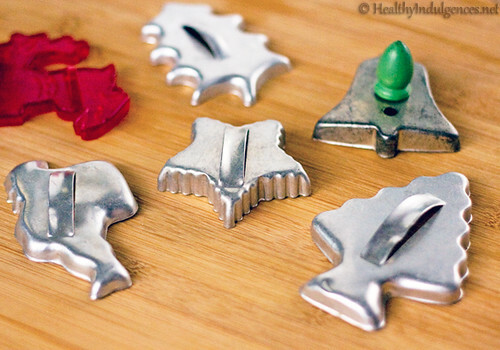 Your grandma's cookie cutters are beautiful! Nice work with the recipe. Also, I love iHerb! Thanks for the giveaway! It's fascinating reading about your concoctions! I need to win the gift card so I can try out all your cool recipes. Your cookies look amazing! I'd love to win the giveaway! These look good! I never thought about eating them from the freezer, good tip. Your blog has been such a blessing to me as a mom with a newly diagnosed son with type 1 diabetes. My family has enjoyed several of your recipes without a spike in my son's blood sugar. Thank you so much for all your hard work. Thanks for the giveaway, and especially for all your hard work in coming up with these great recipes! Merry Christmas! i love sugar cookies, but always turned away from them sadly. thanks for the beautiful receipes! Oh yay! I love iherb.com and find that a lot of the things I need are much cheaper there than places like Whole Foods… even better than Walmart (like the coconut oil)… thanks so much for doing this giveaway! Thanks for the yummy recipe! I can't wait to try it! Thanks for doing such an awesome giveaway! I'd love to do these for my daughter's school treat for her birthday! I was diagnosed with gestational diabetes so this looks like a great recipe I can actually eat myself. You've certainly got me in the mood for tomorrow! 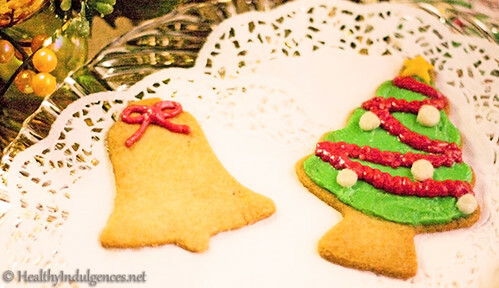 I really want to try these…at the moment I don't know where my cookie cutters are. In storage, probably. But someday soon when I find them, I'm gonna make these for my low-carb-eating fiance! I have been searching the web for a sugar cookie recipe like this 7 was just about to purchase some erythritol for the first time to make some of your other recipes! This is going on the top of my list! Great giveaway!! I am cosmicbubbles@yahoo.com. Merry Christmas! Great giveaway Lauren. I have been following your blog for a couple of years now and am also an iherb customer. Thanks Lauren and keep giving us the recipes. These look awesome, cant wait to try them. Ooh, these look great. I'm done with my holiday baking, but I'll have to keep these in mind for next Christmas. Or maybe New Year's cookies can become a new tradition? Thanks Lauren, these look so good. Can't wait to make them! I would also love the opportunity to try iHerb! I hope you have a wonderful Christmas! These look beautiful & delicious. Great cookie recipe. I'm finding more of my friends are going gluten-free and it really helps to have something around they can eat! Love your blog!! Thanks for the giveaway offer to win. I also facebook posted with link to your blog. Thanks so much for the great recipe!! I'm going to try it tomorrow! Fun recipe! I've got a batch of coconut flour brownies in the fridge…can't wait to try them. these look great! love the healthy baked goods! Steph, I’m so glad they turned out well for you! OHHH! Have been dying to try xylitol-thanks for the chance to win! I'd love to try this company out! These cookies look fabulous! Can't wait to try them! Thanks so much! I`d love to be apart of this giveaway! P.S. Have you ever tried low-carb, grain-free Halva? I love the Achva sugar-free marble Halva, but would love to be able to make it at home. Any experience with it? Thanks! Pam, I have not tried making Halva. Do you have a recipe for it? It looks beautiful! I would wager that a sweetener like Swerve, mixed with a little bit of honey, would yield the best results since Halva involves tahini. Nut butter are high in fat, and tend to work best with a tiny bit of real sugar added to the mix. Thanks Lauren!! They look really good. Can't wait to try these cookies. Thanks for iherb link. These cookies look delicious! And thanks for hosting a giveaway! I think my family is going to throw me out of the kitchen at the rate I keep hogging it to test out various recipes…but I refuse to stop! This one goes on the list right after I finish the last round of truffles. Ach, that's what I get for submitting too fast. Tweeted as well. (And it's sweet of you to do this, thank you! I love your site and iHerb, too! Just made your Healthy Chocolate Cake (with the beans! )which is a total favorite in my household. I'm depleted on lots of my healthy ingredients after the holidays so I'd love to win the iHerb giveaway. Thanks for sharing all your delicious recipes and making living a healthier lifestyle so much easier and tastier! My daughter,grandchildren and I made a family recipe for giving. Now I can make these beautiful cookies for my husband and I. Thank you for a wonderful recipe and the effort and time you put in to make my life sweeter. I can't wait to try these cookies. Tempting as these look, I'm still reeling from what I only refer to as the great magic cookie bar incident of '11. Winning the iherb contest would make my month!!! Harstine at gmail. Thank you! Mmmm, will have to try these! And please enter me in the contest! Thank you so much for this recipe! I'm anxious to try it. And thanks for the freezing tip! I'd love to be entered in the contest as well! These cookies look amazing and I am going to try them. Would never have thought of the freezer. This looks like a great recipe. Thanks! so please enter me again! Ooops, I was the second commenter, but I forgot to include my e-mail address. Here you go: jennleighmason at gmail dot com. Thank you for hosting the giveaway and for all of your fabulous recipes! Haven't tried these yet, but have tried lots of your other recipes, with great success. And you have the most awesome pics! Would love to enter the giveaway – bdown227@hotmail.com. Thank you, Barbara! Have you gotten the chance to try the cookies yet? The cookies look great. I only have one complaint. ANTIQUE cookie cutters!!!! 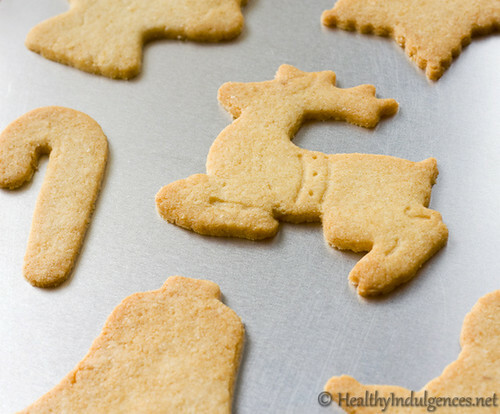 I used those exact same cookie cutter when I was litte and my mom made sugar cookies. They were definately not antiques back then. ;-). How do you make the frosting on the sugar cookies? These look so yummy. I dyed it with food coloring. Hope that helps! Your cake looks fantastic by the way! Thank you, Vinay! Have you gotten the chance to try it yet? Thanks for this healthy cookie recipe, I'm gonna make heart-shaped cookies for Vday! It's time to practice. Would this work with coconut flour as the gluten free flour? Or maybe flax seed meal/flour? I'm on the hCG diet and will be making these for Valentine's Day, while I'm on phase 3 of the diet, which means I can have no sugar or starch. I love your website as MANY of your recipes are usable for me during this time of my diet. Hi, Michele! Coconut flour would make these cookies turn out dry. I’ll update the recipe this year (2013) with a grain-free version. Hi, JoAnne! If I figure out how to make these grain free, I will update the recipe. JoAnne – Unfortunately there's not a substitute for g-free flour that would yield the same taste and texture. Meg, do you eat honey? If so, I have a great egg-free recipe for you. I do not have millet flour. Would oat flour or buckwheat flour work? Lauren, thanks for your question. Either flour would work. However, buckwheat will lend a very strong flavor to the cookies. Hi, Maureen! I used my basic Sugar-Free Cream Cheese Frosting, dyed with food coloring. Hi there, i live in south africa and we do not get the almond flour. can i just substitute it all for just gluten free flour? Hi, Caz! Great question. Without almond flour, these cookies would be too dry. Hi all! I have to tell you, I made these last night with my kiddos…..and they turned out fabulous! I mean, like really fabulous! Very buttery rich and sweet…perfect! I did use oat flour and I used erythitol and xylitol combo. I added in a table spoon or two of agave because I wanted added sweetness. Only thing I would change for next time is double maybe triple the recipe and make cookies thicker. I think I will use this recipe for my holiday cookie exchange this year! Thanks Lauren! Glad to hear the cookies turned out cookie exchange worthy! That’s high praise. 😀 Thanks for the feedback, Jodi. Thanks for the great cutout cookie recipe! Can’t wait to give these a try. I look forward to trying these out in the next couple of days. Thanks so much for all your hard work. Have you figured the carb count? How about coconut flour instead of the millet? Okay, Lauren, I’ve got a query for you. You mention using the freezer after these have been baked. Do you have any experience with storing the unbaked dough in the fridge or freezer? I’d like to make this ahead of time to take to my parents home so that there will be no excuse not to have good sugar free cookies, but I doubt mom will let me use her kitchen , as she’ll be using it like a headless chicken. So can I premake this a week in advance and chill it or freeze it and thaw it later to roll out and cut and bake? Metqa, your comment about your mother made me laugh! You can definitely freeze or refrigerate the dough. It will roll out good as new when you thaw it out a bit. 🙂 Hope you and your parents have a lovely holiday together. By the way, what do you think of the new site? You are the first visitor to leave a comment since it was launched! It’s great to see you commenting again. Oh, I’m Loving it! I’ve been all over it all afternoon, when I should have been out raking leaves! LOL. I knew something was different, It’s very bright and cheerful and easy to navigate, not that it wasn’t before, but it seems much moreso now. I need to make some more of your yummy recipes. They have always helped me to resist temptation. I think my favorite has to be the Reptar Bars! Rawwr! Plus it’s fun to say “I made this” and then give folks the link to your site. Oh, and I haven’t kept up with time, but congratulations on Graduating! Sweaty Jain, 1/4 cup Truvia and 1/4 cup coconut sugar should be enough to sweeten the cookies. Taste the batter and add more coconut sugar if needed. Remember to grind your sweeteners to a powder in a coffee grinder or Magic Bullet before adding it to the dough. Hope that helps! What is your view on this ? Do you think that there is a discussed "editorial line" defined within the NYT (and whomever) regarding energy/peak oil, or is it just this journalist point of view ? This is a totally … This is a totally stupid discussion on voter IDs and even Thom doesn’t get it. Number 1: YOUR SIGNATURE is your valid ID now and for all time and that is why a photo is totally UNNECESSARY and because the signatureï»¿ is used and signed on the spot is why there is such low voter fraud. Number 2: County election boards determine the VALIDITY of the voter’s registration, not Acorn or anyone else that merely submit’s the registration application. Was this answer helpful? Hela EU Ã¤r nu pk sÃ¥ nu har vi verkligen ingen yttrandefrihet kvar. Jag har aldrig hÃ¶rt att Muhammed skulle ha haft epilepsi men han kan kanske ha varit mytoman? Wonderful Post! I love the idea that Christ is our spiritual Christmas Feast! I also love the smells of Christmastime, and that includes all of those things that make my spirit feel full–like good Christ and Family-centered Christmas music. Looking forward to more Christmas posts in the future!